Whether lolling in the sun or curled up on the couch, it may seem like your cat sleeps all day. In fact, cats spend an average of 16 hours a day sleeping! But why do cats sleep so much? And should you ever be concerned about your cats sleeping habits? Like their ancestors, cats are predatory animals, and crepuscular too! This means that they’re predisposed to hunt and be most active at dusk and dawn. While your kitty may not “hunt” the way a lion or tiger does, she still spends lots of time pouncing, stalking, and playing. This takes up lots of energy! Cats sleep so much during the day in order to conserve as much energy as possible. While cats get lots of shut eye, only 25 percent of that time is spent in deep sleep. The rest of the time they’re dozing in a light sleep. You can tell because a cat in light sleep will twitch his or her ears, respond to noises, and wake more easily. In other words, kitty probably isn’t sleeping quite as heavily as you think. 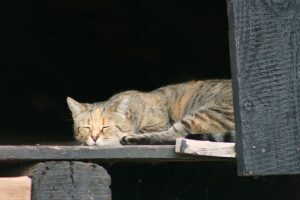 While all cats sleep during the day, factors such as age, personality, and even the weather can have an effect. Kittens and older cats, for example, tend to sleep longer: closer to 18 hours. Cold temperatures and rainy days can also cause kitty to get a little sleepy. However, health is an important factor too. If you notice your cat sleeping far more than usual, don’t hesitate to check with the vet to make sure it’s not hypothyroidism or another serious ailment. Whether you have a sleepy kitty or a furry little ball of energy, rest assured that our cat sitters will give your cat exactly as much attention as he or she prefers. Call today! Is your cat’s poop too smelly?